Ultra Energy Bars + A Giveaway! I was so thrilled to receive a preview copy of this new book and be able to share this amazing recipe with you! 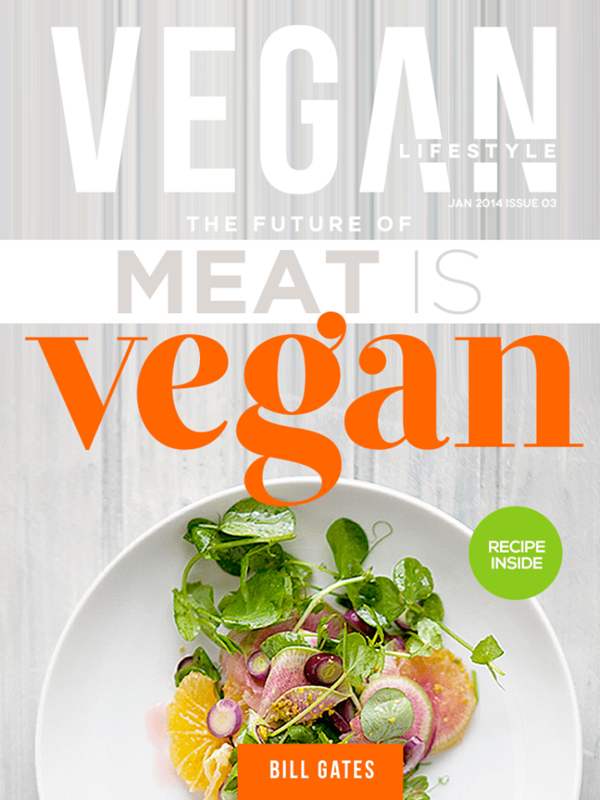 It’s a gorgeous book featuring 120 healthy recipes and lots of tips for a plant-based diet. A definite must have! There are so many good things about this book it’s hard to find a starting place. It’s a beautiful book and the recipes are easy to make and delicious! This book is a great guide for anyone who wants to move their family towards a more plant-based lifestyle. 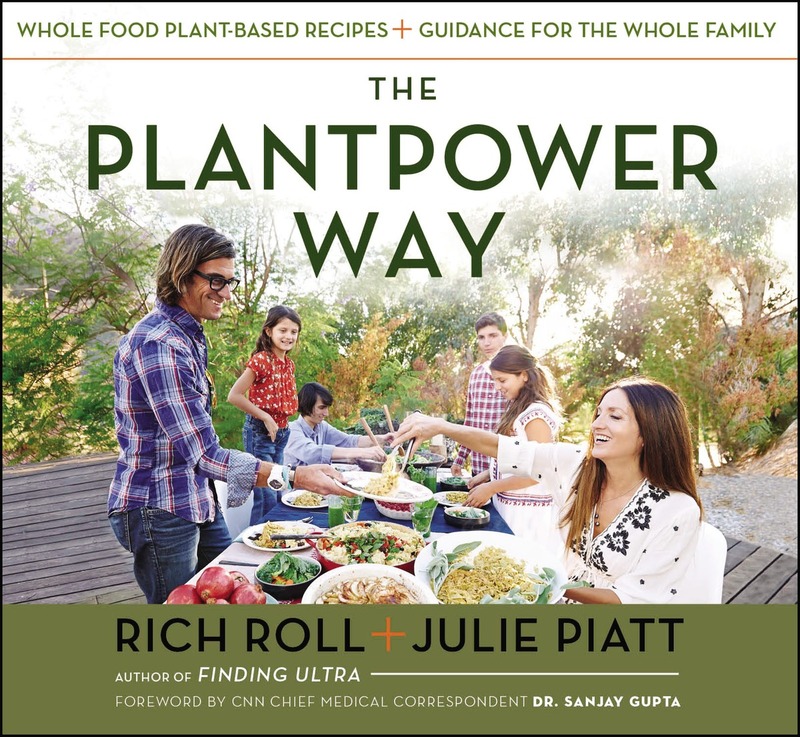 Packed with advice and practical tools like shopping lists, information on ingredients, simple cooking techniques, and more, THE PLANTPOWER WAY will help readers get back to the food that truly nourishes our bodies and souls, one healthy and delicious meal at a time. Who loved these bars in my family? Everyone did! Especially my 5 year old son, he might have eaten the majority of them! Time to make some more. 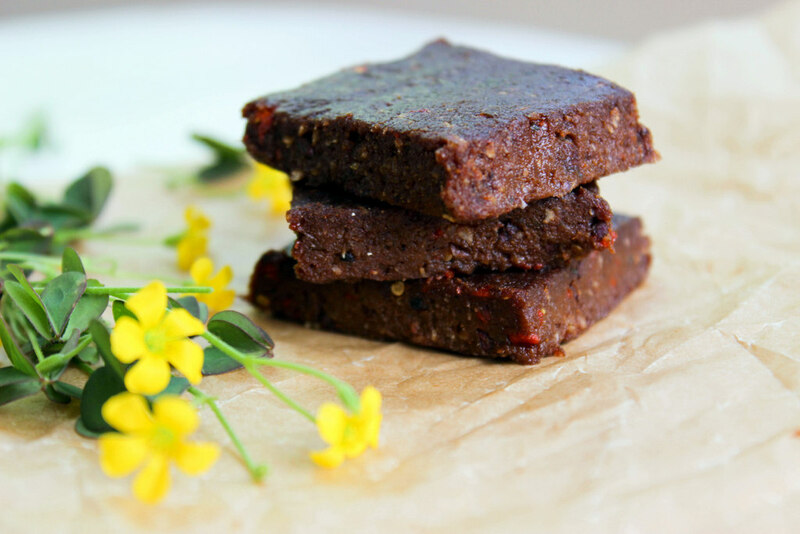 Rich isn’t the only one who loves the supercharged vitality he experiences from eating these nutritious homemade bars – our kids devour them as a healthy alternative to processed store bought varieties. Power packed with healthy ingredients like nuts, seeds, coconut and dried berries that boast a plentitude of protein, healthy fats and fiber, these energy boosters will keep your engine revving all day long. Great for packing in your child’s lunchbox! Eat one of these bars and then, as Rich says, get it done. In a food processor, pulse nuts until mealy in texture. Now add the cacao nibs, hemp seeds, goji berries, cacao powder, shredded coconut and sea salt to the processor. Pulse again until ingredients are well-incorporated. With the motor running, add one date at a time. After seven dates, you will see the mixture ball-up on one side of the bowl. You may need to redistribute the mixture and process it again to make sure the dates are mixed in. On a piece of parchment paper, press the cookies in an even layer about ¼” thick. With a knife, score out a grid of rectangular shaped pieces approximately 2” x 3”. If desired, press additional hemp seeds or shredded coconut on the surface. Wrap in parchment paper or parchment bags. Take them out on a trail run, hike or bike ride to sustain you throughout your training session! Avery Books has been generous enough to give me a copy of this book for a giveaway! The giveaway is open to US residents only and will run through 11:59pm on 5/8/15. Please use the box below to enter. CONRATS TO HOLLY EDWARDS ON WINNING A COPY OF THE PLANTPOWER WAY!!! Spring is here and if you are like me, you are ready for some beautiful, fresh looking food that fits well with sunshine and soft breezes. I want to thank the beautiful weather we are having for inspiring this smoothie bowl. Sometimes it is difficult for my mornings meals to be as balanced as I would like. I am constantly running from the minute I wake up during the week, so I might grab a piece of toast with hummus and my cup of coffee and go! When the weekend comes and I have some more time to get some creative and healthy foods on the table I am one happy momma. I didn’t know what to expect from my 7, 5 and 22 month old when I changed it up from our regular old smoothie and presented them with this smoothie bowl. But, they absolutely loved it, ate it up, and asked for more. They loved being able to pick and choose their own toppings and decorate their smoothie bowl, so that was a bonus! Anytime they can take ownership of the food they are eating is a win-win situation at our house. I want to thank the good people over at Sunwarrior for supplying me with their fabulous products to take this smoothie bowl up a notch. I added some of their raw, vegan, sprouted and fermented vanilla protein and raw supergreens. I love getting some extra health benefits out of my meals especially when I am feeding them to my children. I love that smoothie bowls give us a fresh new way to enjoy our smoothies and they are so beautiful to look at, don’t you think so? I just feel good eating these types of meals and also feeding them to my family. If you start out your day with a healthy breakfast like this one, it will give you energy, satisfy your appetite, and set the stage for an amazing day! 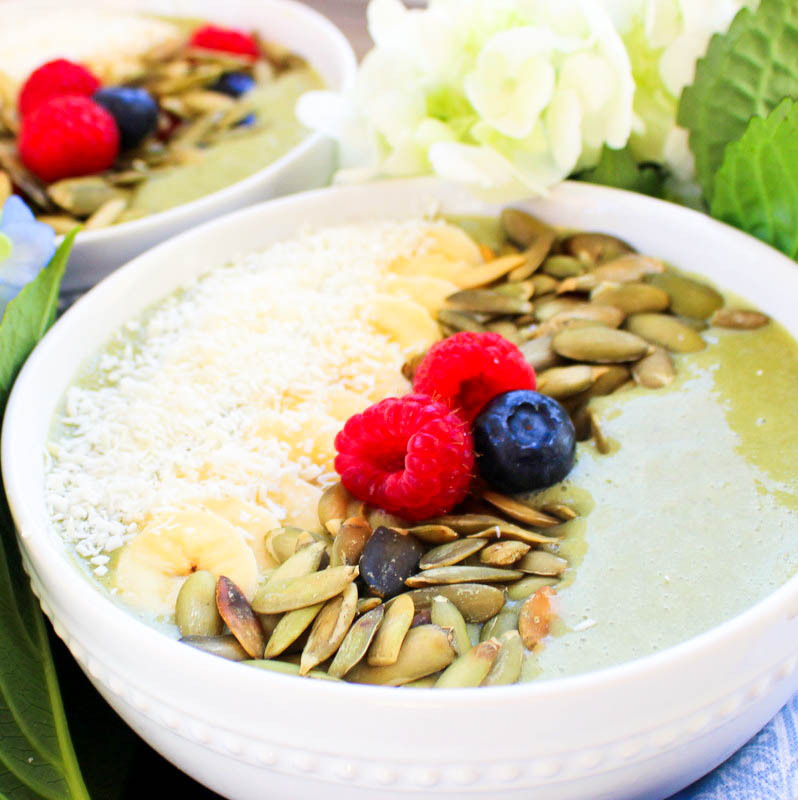 Spring into wellness with this delicious protein and superfood smoothie bowl to start your day. Add all smoothie ingredients to a blender and blend until smooth. Transfer to a bowl, and top with your favorite toppings! Enjoy! 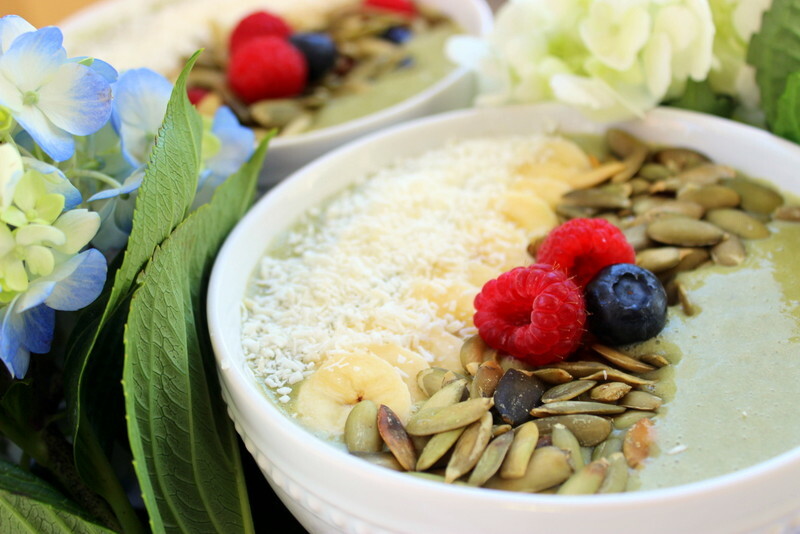 Have you ever tried a smoothie bowl before? What’s your favorite smoothie to make? Welcome to the first edition of “Pure Voice”! I could not think of a better person to start this exciting new section of Pure Thyme than with the beautiful and talented Ellie Bedford. 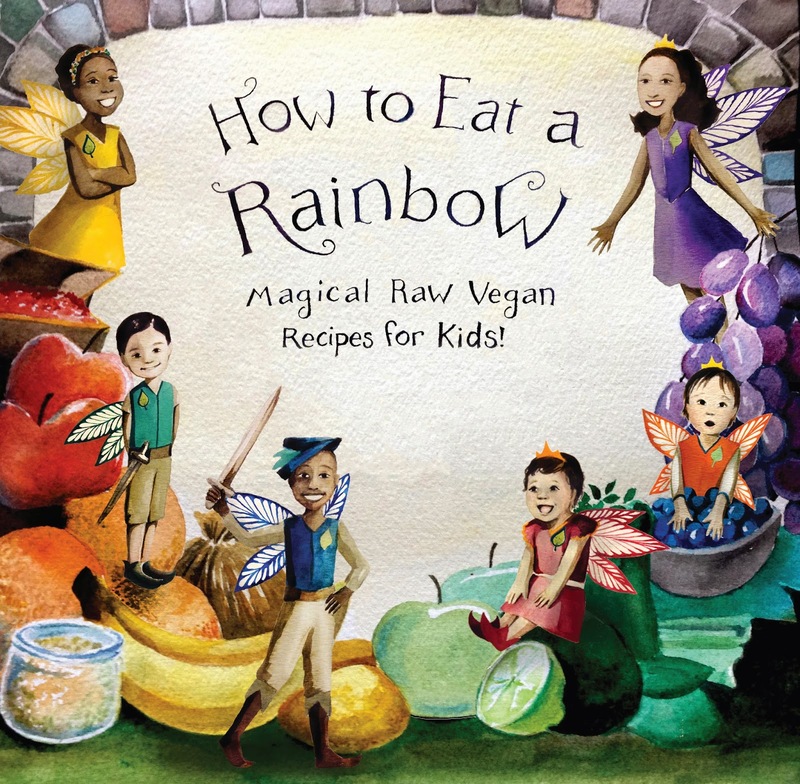 I was first introduced to Ellie, when she reached out to me about an amazing children’s recipe book she was creating with her sister Sabrina Bedford, “How to Eat a Rainbow: Magical Raw Vegan Recipes for Kids”. 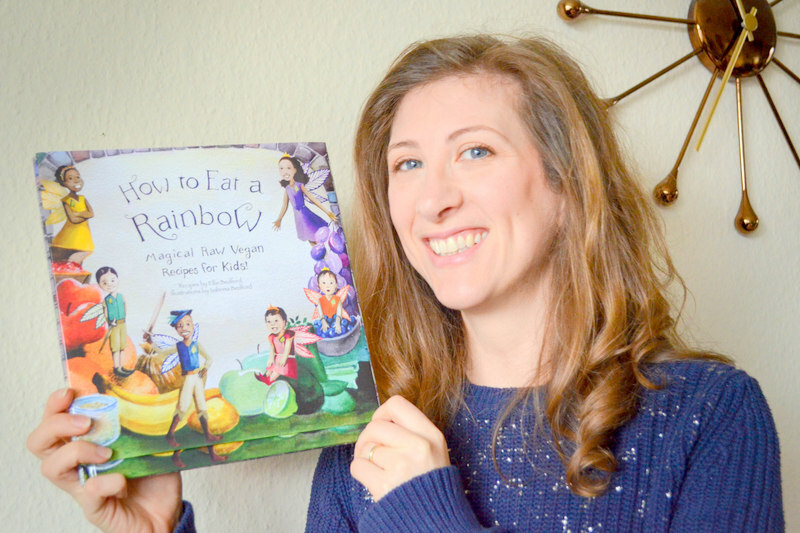 This is a magical themed healthy children’s recipe book that promotes a balanced whole foods diet. This book is filled with creative, delicious recipes and it is beautifully illustrated. If you have children you must have this one in your repertoire. It really gets kids excited about healthy eating! My own children adore this book and love to make the recipes with me in our kitchen. 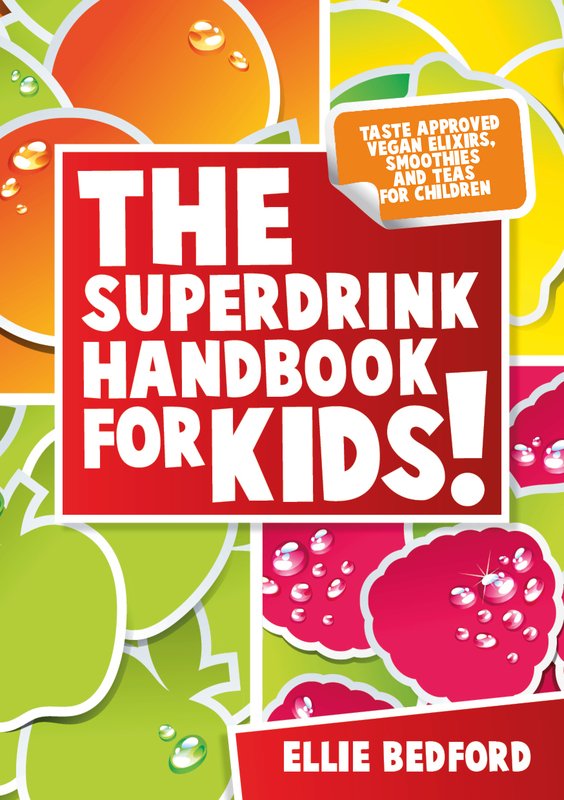 Today I am featuring a recipe from her new book “The Superdrink Handbook for Kids!” This book features twenty exciting refined sugar-free and vegan recipes that kids will love and that will make a wonderful addition to adult diets as well. When I started my new blog, I wanted this to be a place where the people I meet through my journey can come share their story and help inspire us to find balance in our lives. I have been so hard on myself in the past and have worked to find “my balance” and I want to know how you find yours. Now take it away Ellie! As a home educating Mum of two girls, and somebody who works from home, I have to admit that keeping balance in my life is something I struggle with. Being a Mum in the 21st Century has its challenges. It’s very common now to be raising our children, taxiing them around to activities, while running a household and working a paid job; and it is easy to feel that sometimes, there just isn’t enough of us to go round. While the kitchen is often a sanctuary for me, and a place to express my creative side, cooking also brings with it some challenges. I truly believe in the health-giving power of whole-foods, but there aren’t many short cuts when it comes to preparing this kind of food, and it demands a lot of my time. The smell of burning beans is (unfortunately) a frequent aroma in our household. When I’ve been deep in a project with the girls, or writing an article, and become so engrossed in it, the beans that I’d lovingly soaked the night before, and put on to simmer are quickly forgotten and far from my mind! I have moments when I envy the housewife of the 1950’s, it seemed so much simpler then. Being able to walk to the local shops which are now all but gone, rather than struggling with busy traffic and finding that elusive parking space when you need to pop out to buy something. Imagine a time without mobile phones and email too, without being on call 24/7 and when you could really live in the moment. It was a slower pace that I often wish we still had. But of course, we are super lucky now in many ways that we just weren’t then, and so the world re-establishes its own natural balance. For me keeping in balance means taking a break from the home and all the work that comes with it. Our home is the focal point of all we do – educating, working, cooking, cleaning, it all happens here. And while I do feel very lucky that I get this time at home when so many people don’t, I truly do need that space away too – sometimes you need some distance to appreciate what you have. It also gives me time to reflect and just be, and to enjoy quality time with the family, without having to stare at that pile of dishes in the sink. 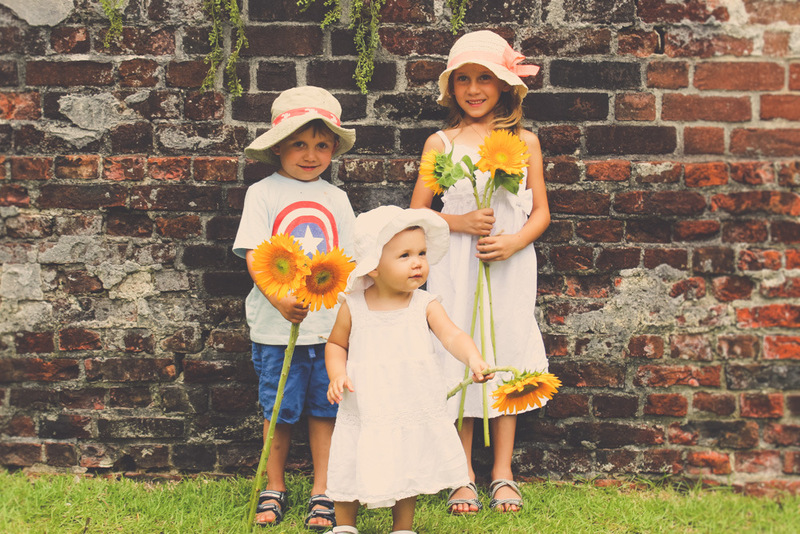 With a background in archaeology and a lifelong passion for history, I love to escape with the family to historic houses and gardens. I enjoy walking in the beautiful grounds, exploring the different rooms of the houses, and taking in the atmosphere. Sometimes you can just imagine what it was like there all those years ago, in a time when life was slower paced. From simple Tudor family homes to18th century mansions or crumbling castles, you name it I love them all, I am a total history geek. Luckily for me, so is my husband and our girls! So that’s where you’ll find us most weekends, exploring the past, chatting to historians about infamous characters that once inhabited the houses, uncovering long ago stories of love and bravery, browsing the gift-shops and enjoying that cup of tea in the café that I haven’t had to make myself. For me this is heaven, and it helps keep me balanced – mostly, I’m a work in progress! 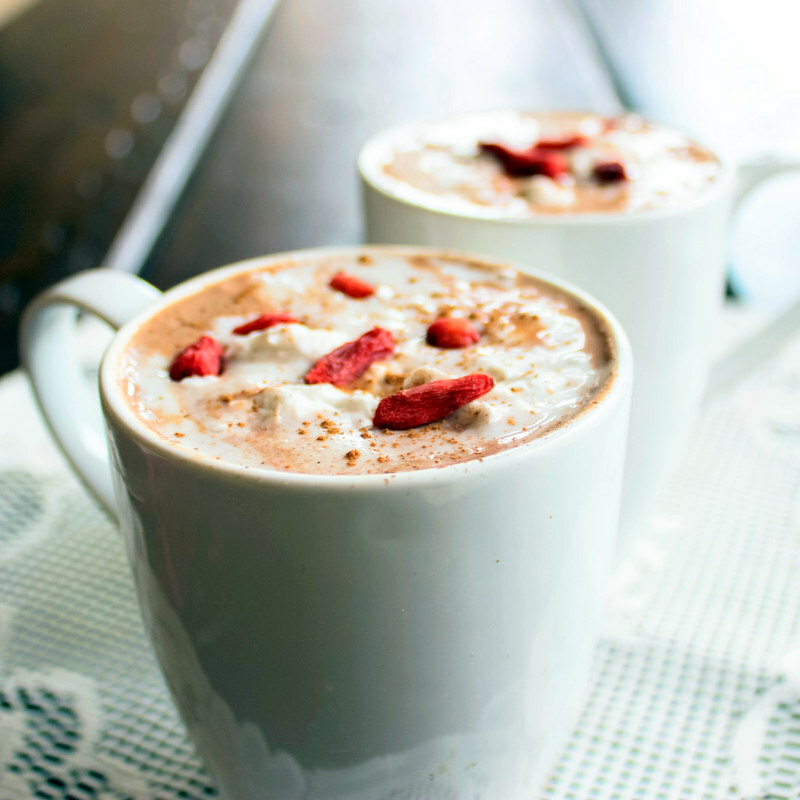 This is a recipe for Nicey Spicey Hot Chocolate from Ellie’s book, “The Superdrink Handbook for Kids!”. It was a hit in our home! A rich chocolate drink inspired by the Maya, a true drink of the gods. This chocolate drink has an extra vitamin and nutrient boost from the rose-hip powder. Make a paste with the flour, cacao, rose hip and arrowroot/purple corn and 4 tbsp of the milk. Heat the rest of the milk in a pan with the maple syrup, cacao butter, vanilla seeds, salt and cinnamon. When it starts to simmer, add the paste and whisk until well combined. Cook on low heat for around 10 minutes until thickened. Pour into mugs and top with a few goji berries. If you fancy, serve with a spoonful of cashew cream. Star Local Ingredient! This grows abundantly in the wild and is easily recognized, harvested and turned into super vitamin C rich rose-hip powder. Always work with somebody who is familiar with wild foods before harvesting anything from the wild and be sure not include the seeds in the powder! Thank you Ellie for sharing your story and recipe with us! You are truly inspiring! IF YOU ARE INTERESTED IN CONTRIBUTING YOUR STORY, PLEASE VISIT “PURE VOICE” FOR MORE DETAILS. Post #2 and it’s another cookie recipe, and why the heck not? My kids love cookies and it’s so fun to make them together – it’s all about building fabulous memories in the kitchen with my family! 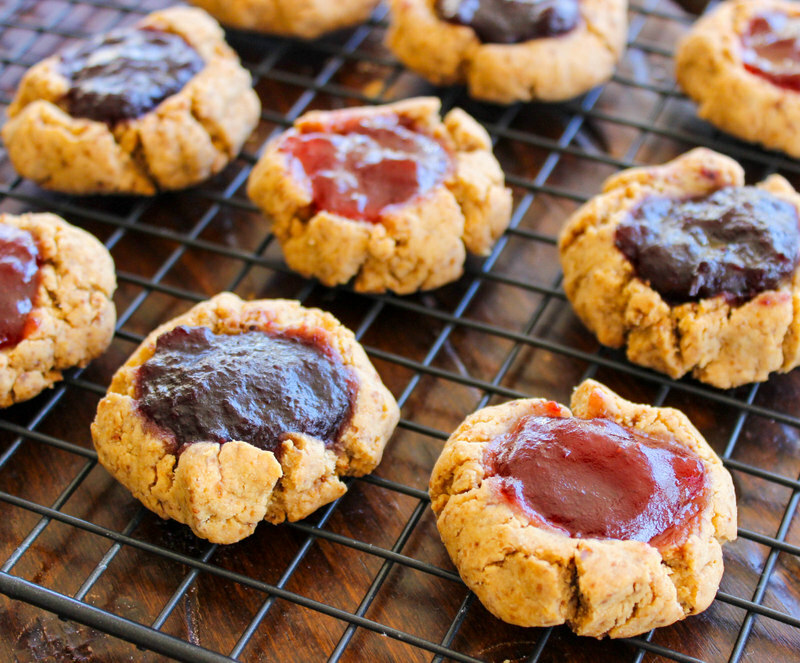 And these cookies….they are just fresh and flavorful, a lovely little cookie that is like a peanut butter and jelly sandwich in the form of a cookie. To be enjoyed with a big glass of milk – milk moustache optional. But, let’s talk about this new gluten-free flour I used: Otto’s Natural’s Cassava Flour. I’m so happy that the good folks over there let me try it out. Cassava, also known as yuca, is a delicious root vegetable that becomes the perfect alternative for wheat when dried and ground. It’s nutritious and easier to digest, plus it’s a gluten-free, grain-free, and nut-free flour with the taste and texture of wheat! 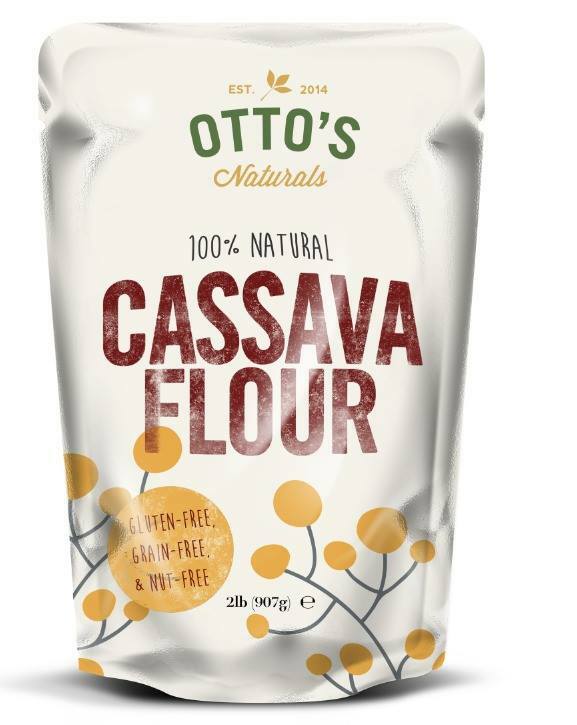 You can read more about Otto’s Cassava flour on their website as well as some other recipes to try out. I have had some serious disasters in the kitchen using gluten-free flours and I can say that this flour was so easy to use and really did bake just like wheat flour. I’m impressed! 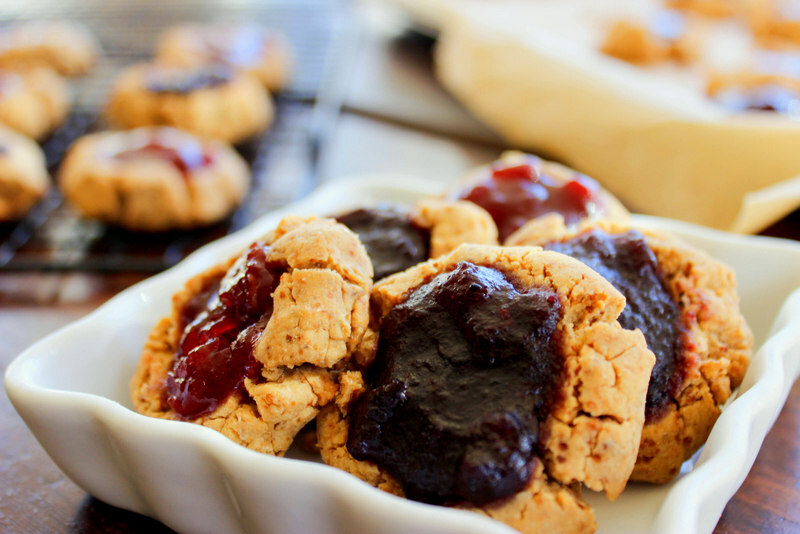 A vegan and gluten-free thumbprint cookie that is so simple to make. Full of flavor and protein, with just the hint of natural sweetness. Get yourself a big glass of milk and enjoy! Preheat oven to 350 degrees F. Line a baking sheet with parchment paper or non-stick baking mat. In a small bowl, mix together the flaxseed and 3 tablespoons water and set aside for 5 minutes to thicken. In large bowl, cream together the first 7 ingredients with a hand mixer. Blend until smooth. Add the sifted cassava flour to the wet ingredients and stir until combined. Place 1 rounded tablespoon of dough on the prepared baking sheet and make a large thumbprint in the center of each cookies. Add 1 teaspoon of jam into each well. Bake 8-10 minutes, or until golden brown. Let cookies rest on baking sheet for 5 minutes and then transfer to a cooling rack. Make sure you use a very creamy peanut butter or these will be too dry. Are you excited to try Otto’s Naturals Cassava Flour? So what does a girl plan to post on her new blog for the first time? Chocolate Chip Cookies of course!!! Duh! 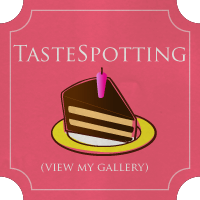 =) Welcome to my new blog – Pure Thyme! Nourish your body with pure food, that is simple and delicious. Find inspiration to have fun, live well, find balance and embrace a more holistic life. I’m super excited to finally get this up and running. I have some really exciting things planned for this place. I can’t wait to see it evolve as I share my adventures in cooking, family life and holistic living. So, how about these cookies? These chewy, scrumptious chocolate chip cookies. They took some tweaking, but I now have my own chocolate chip cookie recipe to add to our family cookbook. They are a new family favorite, so try them for yourself and let us know what you think! You really can’t have enough chocolate chip cookie recipes! 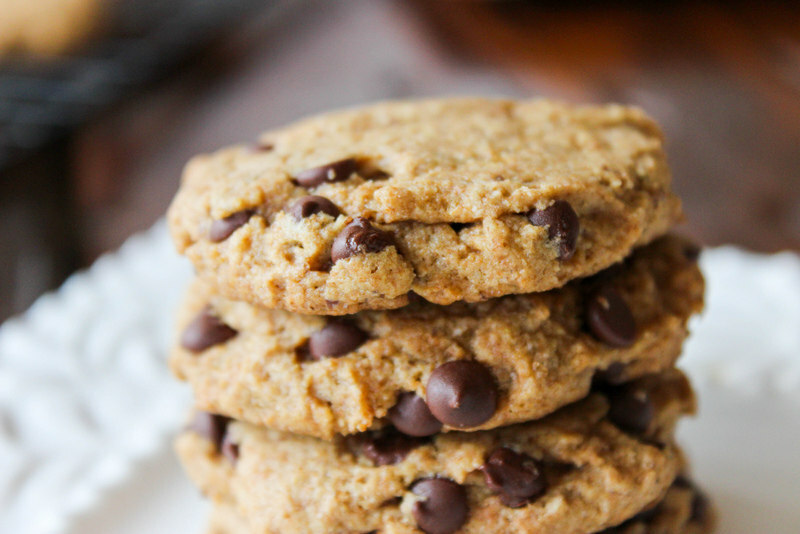 A super easy chocolate chip cookie recipe that is made with spelt flour. 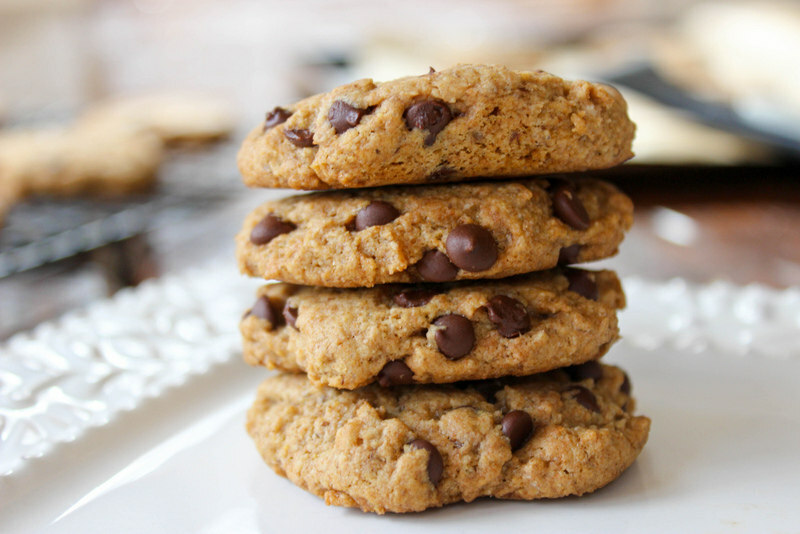 These cookies are lightly sweetened with maple syrup and organic unrefined brown sugar. These cookies will brighten up your day with just one bite. In a bowl, combine the dry ingredients and mix well. In separate bowl, combine the wet ingredients, stir until well mixed. Add the dry mixture to the wet and stir until combined. Fold in the chocolate chips. Place spoonfuls of dough (about 1 tablespoon) on the prepared baking sheet and flatten. Bake 10-12 minutes, until golden brown. Let cookies rest on baking sheet for 5 minutes. Transfer to a cooling rack to cool. 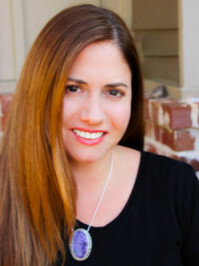 Please visit the “Pure Me” section where I explain more on why and how this new blog came to be. I will be revisiting my recipes from Virtually Vegan Mama and reposting them here, but expect a lot of new content! Please subscribe to the new blog, follow this link. You do not want to miss out on all the fun stuff I have planned here! Oh and please leave a comment and tell me what you think of the new blog! We need cookies around here. 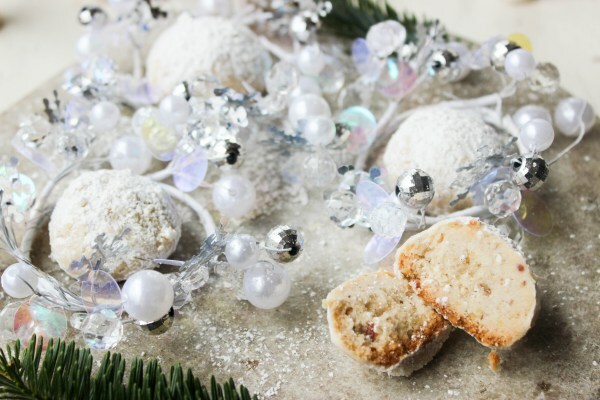 Flavorful, fun and delicious holiday cookies that I can make with my family year after year. So, here we go! 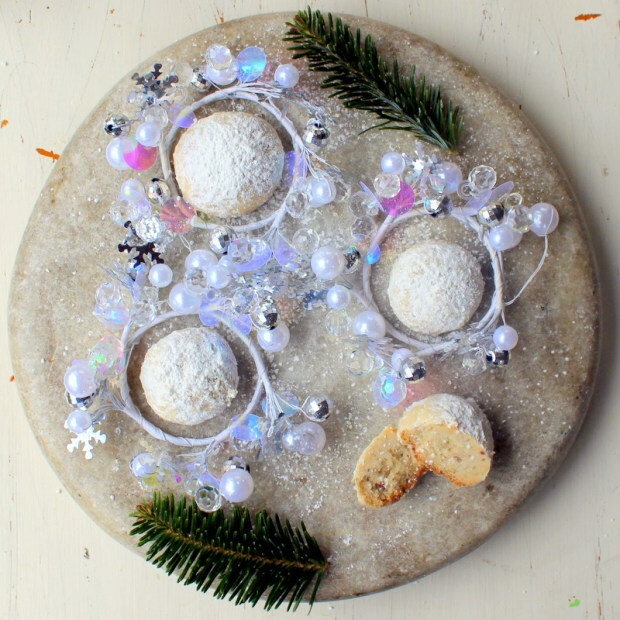 I love snowball cookies and this vegan version is super easy to make and delicious! These cookies have a perfect, soft, crunchy texture with just the right amount of pecans and orange flavor. These can easily be made gluten-free by substituting the flour for your gluten-free flour of choice too. =) My secret ingredient that made these cookies go from great to WOW, was the addition of orange essential oil. What, you say? Essential oils in cooking? Yep! Yep! Yep! I was a bit skeptical at first, but holy smokes! 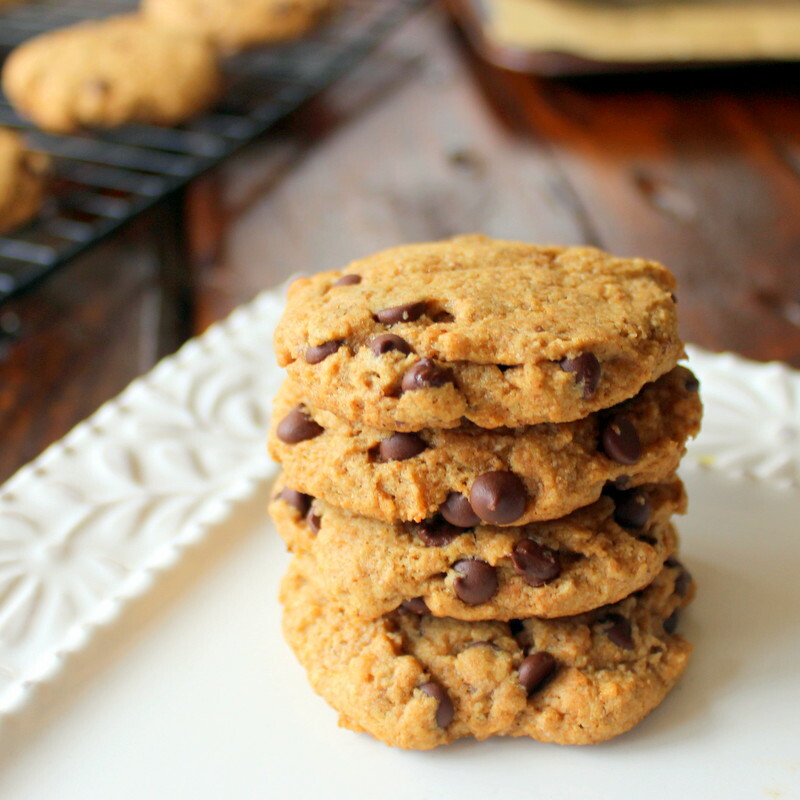 These cookies are bursting with the most amazing hint of fresh, pure orange flavor. It’s very subtle and just the right amount. Orange essential oil has plenty of awesome benefits beside making these cookies burst with flavor. Did you know that orange essential oil can be helpful to colicky babies and help them to sleep and it’s scent is uplifting, can boost immunity and induces relaxation. As a mom of three, I need everything I can to help me relax! Back to these amazing cookies. Can you be in love with a cookie? I think I most definitely am! These cookies have a perfect, soft, crunchy texture with just the right amount of pecans and orange flavor. Combine butter and powdered sugar in bowl. Beat at low-speed, scraping bowl occasionally, until well mixed. Add orange essential oil and stir well. Start with three drops and add more to taste. In a separate mixing bowl, combine the flour and pecans. Combine all ingredients to form a dough. Shape dough into 1-inch balls. Place 1 inch apart on ungreased cookie sheets. Bake 18-25 minutes or until lightly browned. Cool 5 minutes. 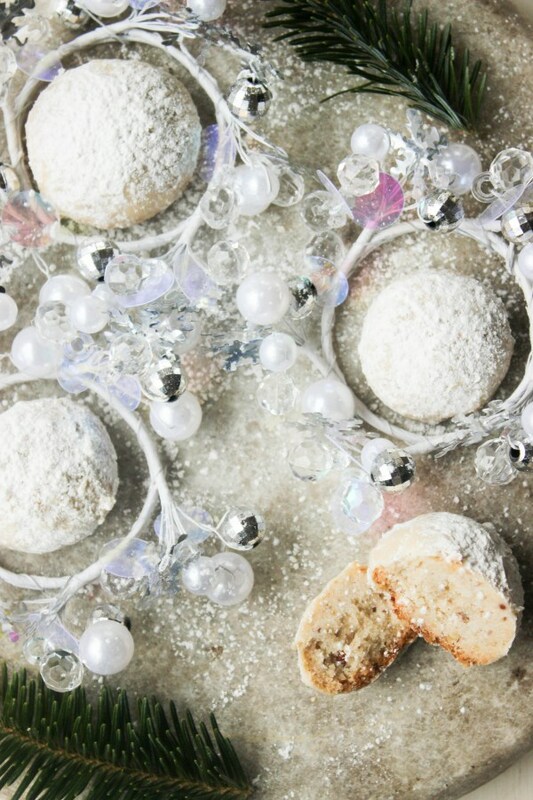 Roll in powdered sugar while still warm and again when once cool. This made 24 snowballs, but you can get more if you make smaller ones. If you would like to learn more about essential oils, click here. The possibilities and options available to you and your health with the use of essential oils is so exciting to me. It is my passion to help others find natural solutions and options to support their own health. Please join my private facebook group to learn more HERE. You can always contact me directly to learn more virtuallyveganmama@gmail.com Enjoy! I was lucky enough to receive Cocozia Organic Coconut Water to review for my lovely readers. I use coconut water almost every time I make a smoothie or juice to boost my potassium and aid in hydration. Cocozia Coconut Water is 100% Organic , contains no pulp, no added sugar, no preservatives, and is not from concentrate. 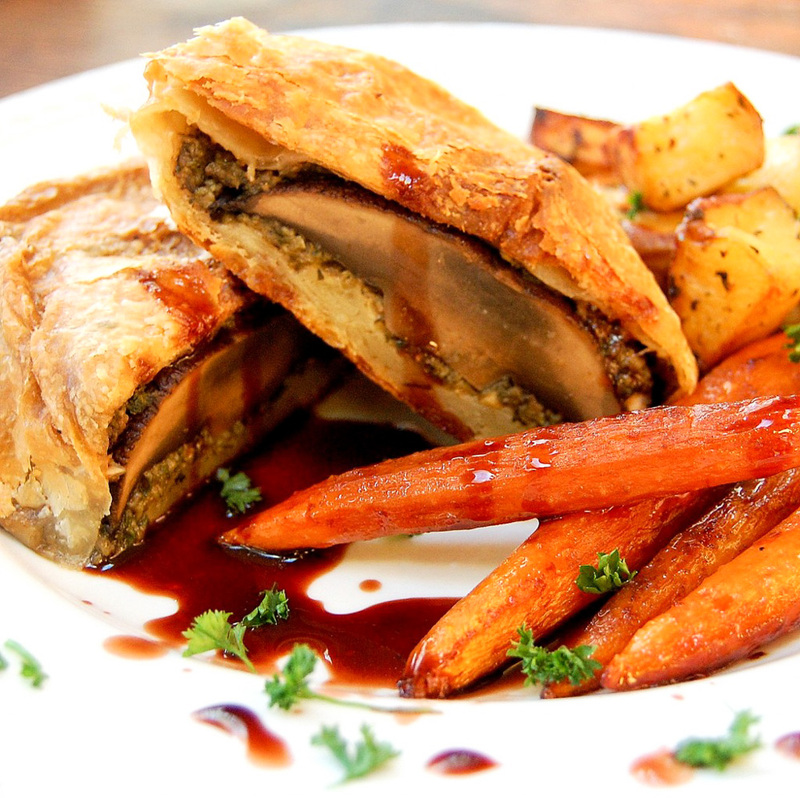 Cocozia is NON GMO verified, gluten-free, vegan and kosher. I found it to have a great taste, totally fresh and pure, I can actually enjoy this straight out of the container, unlike some other brands I have tried. I definitely recommend this one to try if you love coconut water! I also love the added convenience of being able to order a case of twelve delivered to my door with my Amazon Prime membership. That way I always have it on hand and it’s one less item I have to carry home from the grocery store! 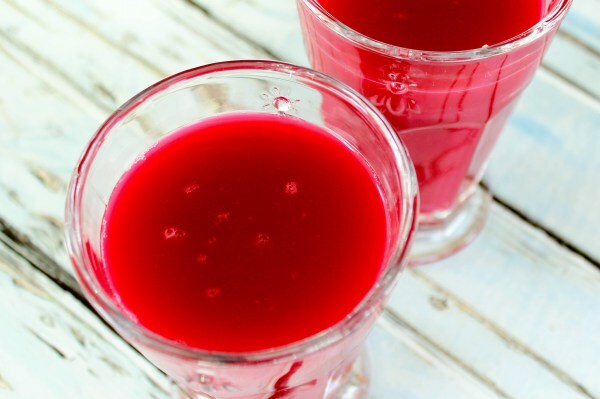 Enjoy this energizing juice to start out your morning for a vitamin and mineral boost. The added coconut water hydrates your body, contains a natural abundance of potassium and magnesium, as well as other electrolytes. This would be a great post-workout juice! Vegan Slow Cooker for Beginners (Rockbridge Press) will take the time and frustration out of cooking vegan at home. This cookbook has 150 easy and delcious vegan slow cooker meals perfect for the busy vegan. 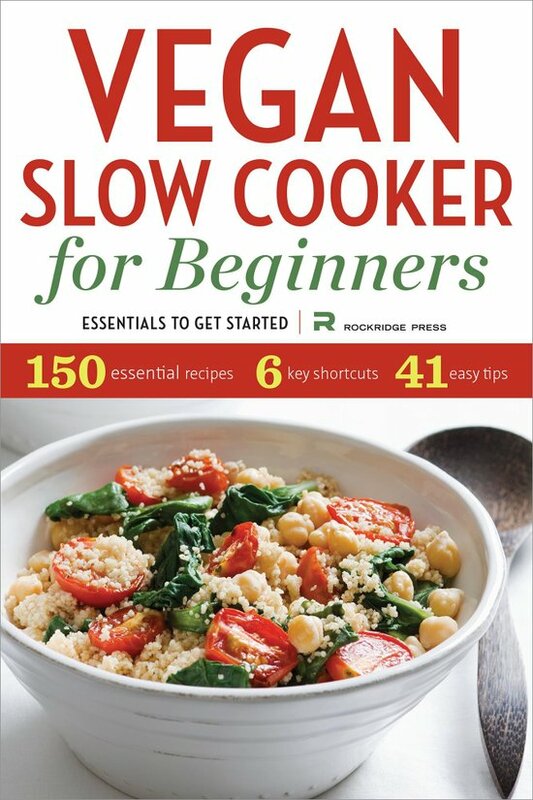 This is a great starter book for creating hearty vegan slow cooker meals. There are recipes for breakfast, snacks, sides, appetizers, soups, stews/chilies, beans/grains and vegetables. Vegan crowd-pleasers, such as Black Bean Breakfast Burritos, Vegan Eggplant Parmesan, and Chocolate-Peanut Butter Cake – this cookbook has it all! I had to offer up this wonderful chili recipe for the giveaway today. It is Superbowl weekend – if you didn’t know – and who isn’t looking for a chili recipe to serve at a party? I know I am! 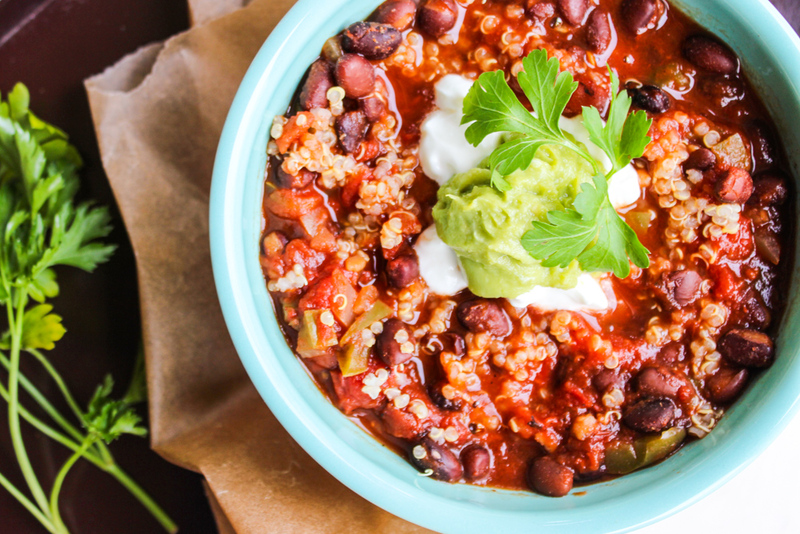 This is a super easy chili to make, it took no time at all to throw all the ingredients into the slow cooker and hit the timer. It’s cooking now and it smells delicious! So, make it today for Superbowl because chili is ALWAYS better the next day. Combine the beans, tomatoes with their juices, vegetable stock, quinoa, onion, green and red bell peppers, garlic, and chipotle peppers in the slow cooker. Stir in the chili powder, coriander, cinnamon, sea salt, and black pepper. Cover and cook on low for 6 to 8 hours or on high for 4 hours. Ladle the stew into bowls, garnish with the fresh cilantro, and serve hot with diced avocado, if desired. I diced the chipotle peppers and did not remove them. I also cooked the quinoa separate. Reheat the quinoa when ready to serve the stew/chili and stirred it into each serving. 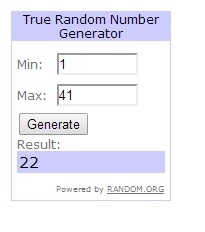 And now for the GIVEAWAY and Good Luck! To enter the contest, leave a comment sharing some of your favorite Superbowl recipe. You MUST leave each entry as a SEPARATE comment or only one comment will count. Like Virtually Vegan Mama on Facebook and leave a comment on my wall. All entries must be completed no later than Saturday, February 8, 2014, at 11:59 p.m. EST. 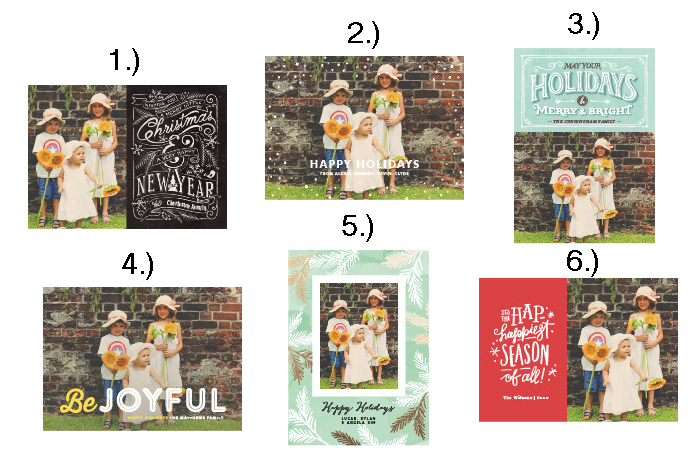 Winner will be announced on Sunday, February 9th, 2014, on my blog, and the winner will also be notified via the email address they provided in the comments section.